I've highlighted Harvest House Publishers as being one of my favorite Christian book publishers. One of the reasons why I sat up and took notice of them in the first place was because they published the Elizabeth George books (i.e., A Woman After God's Own Heart® ). I DEVOURED Elizabeth George books when I was in my late teens/ early twenties. I've always hoped to be able to hear her speak in public sometime, but unfortunately that just hasn't worked out. So you can imagine my GREAT delight when I saw that Harvest House was putting out the Loving God with All Your Mind DVD containing six sessions with Mrs. George. (Happy Dance!!) Harvest House graciously sent me both the DVD series and the accompanying Interactive Workbook - both of which were just released. I had read the book of the same title years ago and loved it. Last year I was culling my bookshelves a bit and, knowing that Lauren and Melissa (my pals from 5 Minutes for Books) were also big E. George fans, I sent them some of my titles. I'm not sure who got Loving God with All Your Mind but whichever of you that it was - now there's a DVD series to go along with it! I think Elizabeth George is meant to be shared with other women. She just has a way of addressing and connecting with women and I really enjoy discussing her books with friends. (We used her books in my "Young Ladies Bible Study" when I was growing up - hence my fond memories and desire to share the lessons that George's book teach.) So, this new Loving God with All Your Mind DVD arrived and I asked Harvest House for permission to delay a review of it until such time as I had the opportunity to go through it with a dear friend who is coming to spend part of our summer with us. They kindly granted permission for a delay and so I'll not be reviewing the DVD series today. I'll be reviewing it at the end of July. (You'll just have to stay tuned!) I'm excited to be sharing this DVD with two friends and then we can give you our various perspectives on it. IN THE MEANTIME....Harvest House offered a giveaway of one Loving God with All Your Mind DVD and the Loving God with All Your Mind Interactive Workbook to one of you! But. That's not all! They also offered a copy of the following two books to go along with this amazing gift! 1. 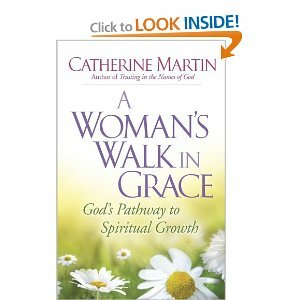 A Woman's Walk in Grace: God's Pathway to Spiritual Growth - I received a copy of this book as well but haven't had a chance to read it yet. (Review forthcoming around these parts when I complete it.) The main idea behind the book is to encourage women to grow spiritually. 2 Peter 3:18 is quoted which says, "But grow in the grace and knowledge of our Lord and Savior Jesus Christ. To him be glory both now and forever! Amen." I've never read anything by Catherine Martin before. Perhaps one of you can share something about her? I'm looking forward to hearing what she has to say in this book. 2. What God Really Thinks About Women: Finding Your Significance Through the Women Jesus Encountered - I also received a copy of this book and DID read it. 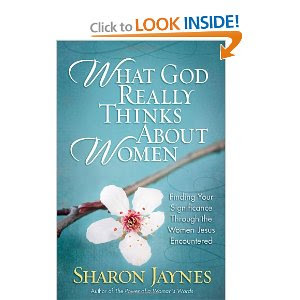 I've read and reviewed some of Sharon Jaynes other books over at 5 Minutes for Books before. My favorite of hers (which also happened to be the most convicting, personally) is The Power of a Woman's Words. (You can click on the title to read my review, if you'd like to learn more about that one!) I had seen What God Really Thinks About Women at the Book Expo and was really curious about it so it was delightful to be able to sift my way through it. I like Jaynes' style and I enjoyed reading this one. So what do you all think? I think Harvest House is being incredibly generous with this giveaway of some of their new titles. I'm delighted to be able to introduce you to these books, but I hope you will find a chance to seek out the titles on your own. Really, if you've never met Elizabeth George (and I feel like I've met her to some extent by reading, oh, every single book that she has ever penned!) - I sincerely hope you'll give her a chance! In the meantime, one of you WILL receive that chance. How to win a copy of all four of these titles listed above? Simply leave a comment below. This contest is open to U.S. Residents only and will be open through Thursday, June 24th. I hope you gals realize that I really try to find and highlight the best of the best - books and items I really believe in! I'd kinda like to offer the disclaimer that I haven't read A Woman's Walk in Grace - because it's not my habit to talk about books I haven't read yet. But I really do tend to trust what Harvest House puts out. So no worries and I'm delighted to share this treat with you all. Thanks, Harvest House, for making this possible and for being so generous. Oh, that is very cool that you get to delay the review of the dvd so you can share it! I have A Woman After God's Own Heart. I agree that Elizabeth George is a wonderful author that speaks to my heart. Oh, yes...Harvest House is incredibly generous. Thank you HH for blessing a reader! Oh I would love to win this! Thank you so much for the opportunity. Definitely count me in. Thanks! I have a friend who would love to read these (after I'm done, of course). Count me in! I'm always looking for good books to help me grow in Christ! Those sound great! Thanks for the chance! I am so excited about this giveaway! I also have devoured E.George's books- gleaned so much from them. I would love to see her DVD. Sharon Jaymes is another author I have read and learned from. Thanks for the amazing giveaway! I think Melissa must have this one, so I would love to win! Actually, I am reading on of the books you sent me now (The Lord Is My Shepherd). Thank you! This sounds like a good book for our church's book club. Sign me up for the giveaway! What a great giveaway! Loving God With All Your Mind was lifechanging for me as one who struggles with fear & depression. What an amazing giveaway! These all sound wonderful! I love Elizabeth George and would love to win. Thanks! Well, now! I had the pleasure of listening to Mrs. George at a conference last fall. :) I also own several of her books and would LOVE to watch this DVD and read the books!!! You know what's funny... I'm not a huge fan of Elizabeth George. I hadn't heard of her until my mom's Bible study started doing some of her books a couple years ago. Maybe it's just that they didn't fit with our group very well, but I always found that the questions didn't really lead to very deep discussions. I think she had some good points to make, but just didn't go deep enough with them. But maybe that's just me! I LOVE Elizabeth George's books! Definitely count me in!!! We *do* realize that your blog features the "best of the best", Carrie, and we appreciate you for it! What a great giveaway. Thanks to you and Harvest House for the chance. Elizabeth George holds a special place in my heart. When I was a new Christian, I joined a Sunday evening class at a new church we had been visiting. The class was using EG's book "Beautiful in God's Eyes". My goal was to meet people and make friends, which I did (btw, we joined the church!) but I also was so uplifted by the material we studied. Wow, what a great giveaway! Count me in. I've read several of E. George's books, but can't remember if that was one. I haven't read either of the other two ladies, either -- I had thought Sharon was the author of My Heart In His Hands, a wonderful biography of Ann Judson, but that was Sharon James, not Jaymes. What a wonderful opportunity! Thank you! 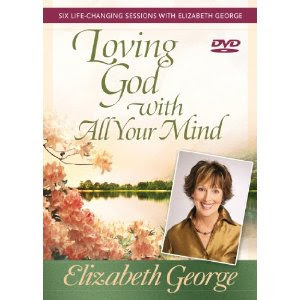 I have really enjoyed Elizabeth George study books and the DVD sounds great. I would love to read these :) *Thanks* for the giveaway! What a cool set of books! Please enter me. What a great giveaway!! Please enter me! We posted about your giveaway at Winning Readings. Sounds like winning trio. I've heard of Elizabeth George also. Please enter me. Pick me, please. I'd love to read these books. Christina - xristya@rock.com - These books are optimistic and positive and I'm so glad that you're having a contest so that one of us can win one! I love Elizabeth George's material, too. She really has helped me grow spiritually through the years. Your review at 5 Minutes for Book has really gotten me interested in reading more of her books again. Thanks for the great recommendations! Count me in. I love Elizabeth George too and Sharon Jaynes. What a terrific giveaway! I've enjoyed several of Elizabeth George's books and Bible studies. I'd love a chance to win this set! This is an awesome gift, truly. I'd love the opportunity to read these insightful books. What a wonderful giveaway. I could really use all of these books right now. Please include me in your giveaway and thank you so very much for the opportunity. I love books that help me grow in my faith. I haven't read any of these, but want to read them all. They have just been added to my wishlist. Thank you Harvest House for your generosity! Whata great giveaway - I would love to win. Thanks! Oh please, oh please, oh please enter me. I am on fire to learn all I can! I want to live a life that glorifies God daily. The only way I can become the woman God wants me to be is by spending time in prayer, and in His word. These books would be a great addition in feeding that yearning to be more Christ like. Thanks for the chance to win. What a great giveaway! These would be wonderful.